I'll start this post by admitting that more often than not, my nails look pretty terrible. I don't bite them, but I polish them and then let weeks go by before I polish them again. The end result is a hot chippy mess. My excuses are as follows: I work from a home studio and very few people see my hands during the day, I use my hands a lot in my work, I don't have a ton of free time, and I refuse to pay for manicures outside of special occasions. All of that said, now that the weather is starting to warm up, flowers are beginning to bloom, and I'm feeling inspired by the season in all its vibrantly colored glory and stuff, I have officially decided to make the effort to keep my nails colorful and in good shape for spring and summer. Despite my excuses (aka laziness), I think that the act of painting your nails is a simple, fairly quick way to do something nice for yourself. 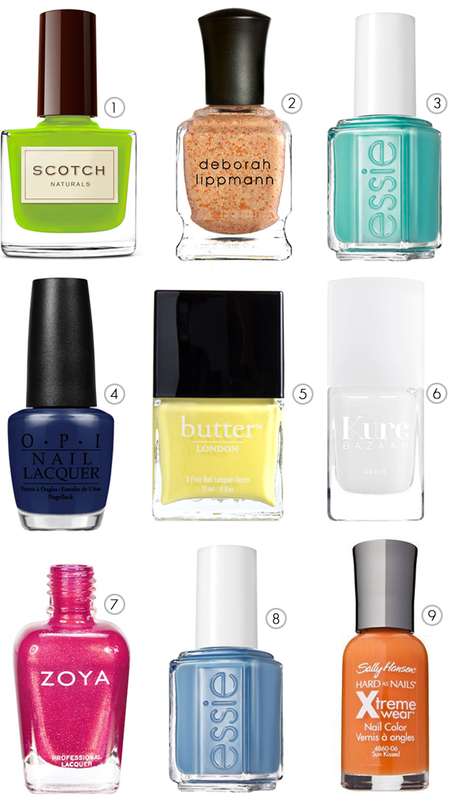 The nail polishes you see above feature my favorite new (or newish) colors from some of my favorite nail care brands. (Right now I'm wearing #3, Essie's In the Cab-ana. It's bold and bright and pretty freaking happy, I have to say.) Are there any nail polishes or specific nail colors you've been especially into this season? Congrats Kelly! Please contact me at bubbyandbean (AT) gmail with your mailing address so we can get you your sunglasses! Congrats to the Ray-Ban winner. Great picks check out my site. Good luck! I would never make such a vow as I know I couldn't keep to it. Haha. My nails are either not polished at all, or chipping almost instantly. I use my hands too much also, crafting and cleaning and whatnot. But these are some pretty colors! I especially like that Essie green...great name too. I've been really wanting to try out that Butter polish! Love the lime green SCOTCH polish. I love all of those colors I usually buy OPI bc it looks and last for awhile. I love Scotch and went to their site to buy some and it was like $50 for 3 bottles I was like forget that lol. Butter is my favorite brand. I just got two new bottles of pastel shades.